Around every corner is something that you have never seen or maybe never experienced before. To visit Sapa or the surrounding districts is to step into another world. Sometimes, it doesn’t even feel like you are still in Vietnam. Elevated, ethereal, energizing, exotic, Sapa took me by surprise. I imagined some kind of French style, alpine town nestling on the wooded slopes of the Hoang Lien Son Mountains at the eastern extremity of the Himalayas. And, to some extent, that is exactly what it is. There are now dozens of small hotels competing for the best possible view of the mountains that soar above the valley. Cloud systems move through the landscape, above and below you, changing the weather from moment to moment. It’s very dramatic. In the heart of the town is a colorful, traditional market with lots of foods and goods I had never seen before. Minority people from five different ethnicities come to sell their crops and fascinating antique textiles. It is a visual feast of all kinds of treasures. I was lucky enough to get a guided tour from chef Quyen Trinh, a charismatic young man who has risen from shoe shine boy to head chef and got his first job cooking in a small hotel right next to the Sapa market. He knows local produce inside and out. Our first stop was a traditional herbalist where I discovered medicinal herbs, local dried mushrooms and fungi of every kind, local corn, rice and apple wines, deep red goji berries, medicinal dried apples and many other delights. The shopkeeper gave us some local ginseng to sample and we left with a bag of interesting ingredients to cook for dinner. On our way across to the meat and fish vendors, we stopped to buy a bunch of lychees from the new harvest. These fluorescent fruits are the most colorful crop at this time of year and stalls are loaded with them. In the meat stalls we found some black skinned chickens. The flesh is blue/black as if they have been dipped in indigo but apparently it is a special local breed! In the next stall, every part of the pig is for sale, laid out fresh and pink on scrubbed, black wooded chopping boards. Everywhere are baskets and bunches of vibrant green herbs and leaves, harvested at dawn and rushed to the market for sale. On a corner, a tiny charcuterie of French influence offers garlic sausage, delicate slices of pork in aspic and smoked meats. In the middle, a busy kitchen has smoke and steam rising from pots and grills as they prepare for a busy lunch hour. The whole market is an intoxicating experience. Quyen is passionate about Sapa foods and is well-known for his fresh, colorful cuisine. That evening we had stir-fried chicken with goji berries and the dried apples served with local rice and steamed cho ko leaves – such delicious new flavors! 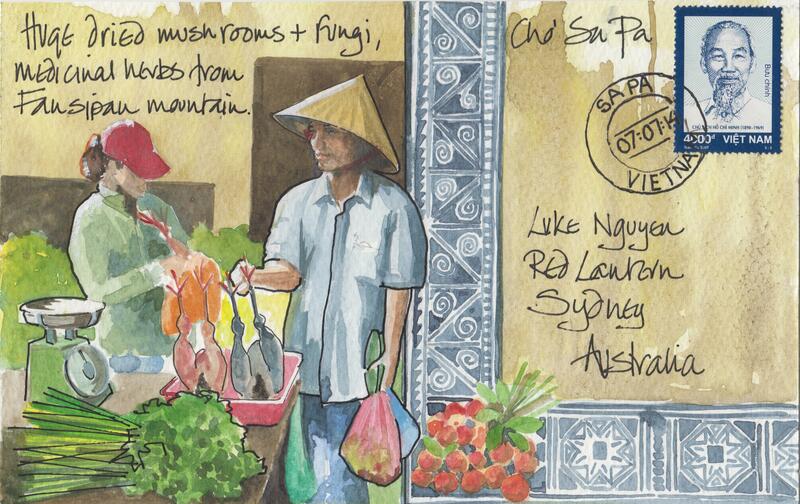 Bridget March is a professional artist and author of A Week in Hoi An. Currently she is the artist in residence at Sapa Rooms Hotel and Art Cafe in Sapa. Bridget is working on a project called Art for Community that will provide a sustainable income for the school in the poorest district in Sapa. She is also offering art classes and sketching tours in her Sapa studio until mid September. For more of Bridget’s work including news of her upcoming book visit bridgetmarch.co.uk.